What Are Some Recipes for Crabmeat Cream Cheese Dip? To make a crab-meat cream-cheese dip, mix 8 ounces of cream cheese with 6 ounces of crab meat, spread the mixture in a 9-inch pie pan, cover it with 12 ounces of seafood cocktail sauce, and garnish with fresh parsley. Refrigerate the dip for one hour before serving. To make a hot crab-meat cream-cheese dip, combine an 8-ounce package of sour cream, two 8-ounce packages of cream cheese, 1/4 cup mayonnaise, 1 tablespoon Worcestershire sauce and 1 tablespoon lemon juice. Add 1 teaspoon dry mustard and 1/4 teaspoon garlic salt. Stir this mixture until it is well blended, and fold in 1 pound fresh crab meat, drained and picked. Spread the mixture into an 11 x 7-inch baking dish, sprinkle it with 1 cup cheddar cheese, and bake at 350 degrees F for 30 minutes. Garnish with chopped parsley, if desired. 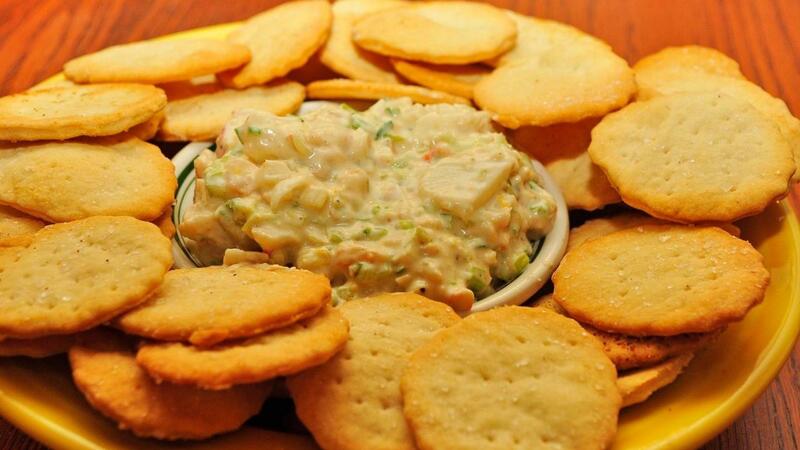 A recipe for microwave crab-meat cream-cheese dip features white wine and slivered almonds. Cook 8 ounces cream cheese in a microwave oven for two minutes, on 70-percent power. Mix the cream cheese with 1/2 cup mayonnaise, 1 small diced onion, 1 tablespoon dry parsley, 8 ounces shredded "Sea Legs" and 2 tablespoons white wine. Add 1/2 cup slivered almonds, 1 tablespoon horseradish and 1 teaspoon Worcestershire sauce. Microwave on 70-percent power for four to five minutes, stirring halfway through the process. What Is an Easy Crabmeat Dip Recipe? What Are Some Recipes for Chicken Wraps With Cream Cheese? How Do You Make Shrimp Dip With Cream Cheese? How Do You Make a Chicken Dip Using Cream Cheese? How Do You Make Wasabi With Powder? What Are the Different Types of Poultry? What Stove Setting Is a Simmer? What Are the Dangers of Eating Moldy Bread? What Is a Recipe for Cream Cheese Filling? Can You Use Regular Cream Cheese in a Mexican Dip Recipe? What Are Some Cream Cheese Spread Recipes?